Crispy Chicken Fajitas – KFC style! I love fajitas, I find them so practical and they are good whether you decide to use chicken, mince or opt for the veggie option. What I find always makes a good wrap are some fried/ roasted peppers, onions, tomatoes, lettuce and grated cheese – I’d say those are always my staple ingredients in a fajita. I love crispy chicken and as I walked past KFC the other day it made me really want a chicken fajita! So I decided to try and make it at home. Once you have made you crispy chicken breast then it’s super easy and you can also make your own breadcrumbs. Slice you chicken and add your other ingredients to the wrap. Otherwise you can make a simple and delicious wrap that’s great when you’ve got a few friends round. Here’s how to make a typical fajita. When I make fajitas with normal chicken chunks or mince I fry the onion first then add the meat and spices and a few minutes before it’s ready add the peppers. These spices are also very similar to the ready-made fajita kits you get but are much healthier! 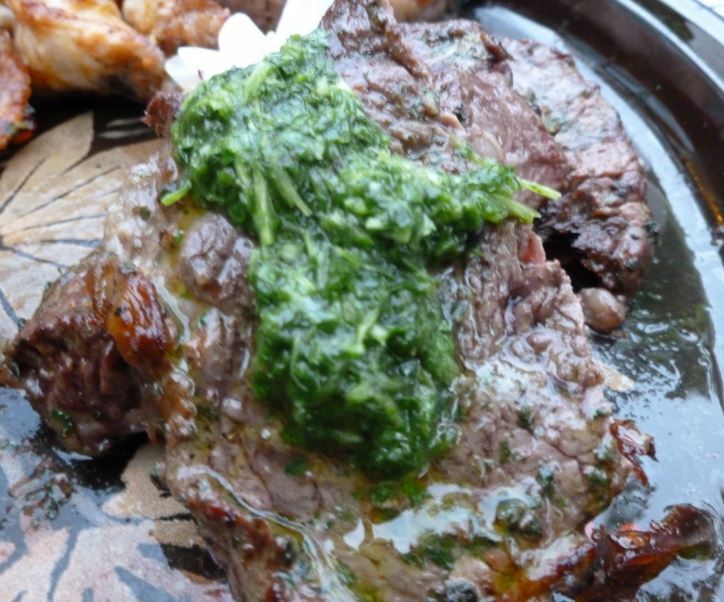 Put the wraps on a plate covered with tin foil and place in a low heated oven for 5 minutes before serving. 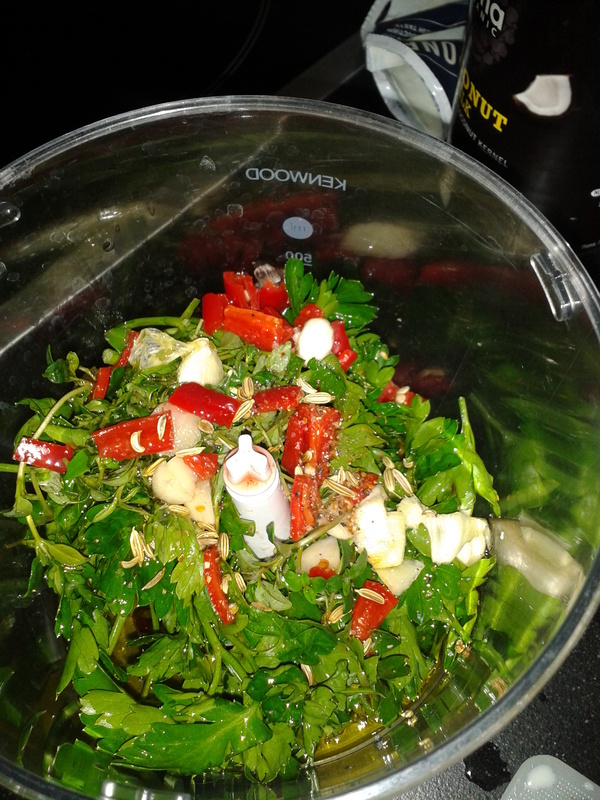 In seperate bowls put the meat, the tomatoes, sour cream,, cheese & lettuce leaves. Place wraps and bowls on table and start filling the wraps with your favourite ingredients. Melt the butter in the microwave, it should take about 30 seconds. In a bowl whisk the eggs and sugar until have a creamy colour and then add 40ml of milk. Mix the flour and baking soda together and add to the mixture. Then add the butter and the rest of the milk and whisk. 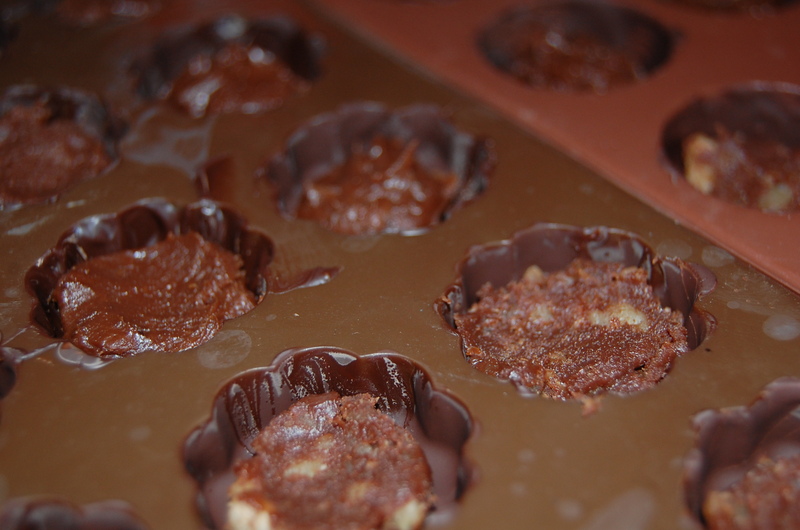 Finally add the chocolate and mix evenly. Butter the madeleine moulds and add the mixture, but not to the top as they will rise! Put in the oven at 240°C for 5 minutes and then lower the oven temperature to 200°C and leave for 8-10 minutes. Make sure you watch the oven closely as they can easily burn. Remove from the moulds as soon as they come out of the oven. Serve with a side veg and either pasta or potatoes or even a nice green salad. Pre-heat your oven to 200C. Slice the chicken horizontally but make sure you don’t slice all the way through and leave one side attached. Open up the chicken so it looks a bit like a heart and place two slice of brie, half of a chopped garlic, herbs and pepper. Close up the chicken and wrap it with 3 slices of bacon. The bacon will act as a plaster round the slit chicken so that the brie stays in the chicken as much as possible. Place both chicken breasts in an oven dish. If you decide to add some sliced onions (does make it yummy) then add just a little olive oil to the onions and with your hands make sure it covers all the onions (this will stop them burning). Then add a tiny bit of water (so it covers about a millimeter of the dish), you don’t need much with this dish as bacon now a days always seems to be full of it. Place in the oven for about 30 minutes, check on the chicken half way through. This shouldn’t take more than 10 minutes to prepare. It’s a very easy meal to make and is really full of flavours. 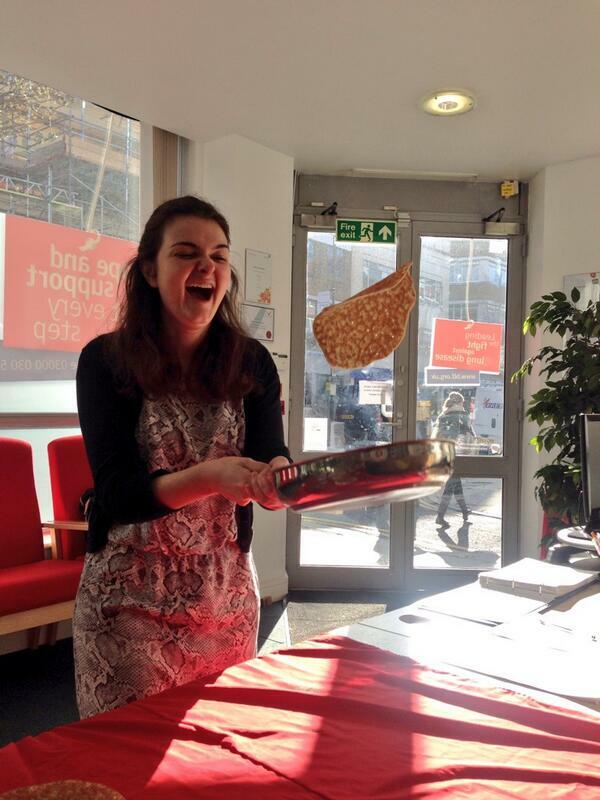 Pantastic flipping for Pancake Day – I only managed to flip 4! 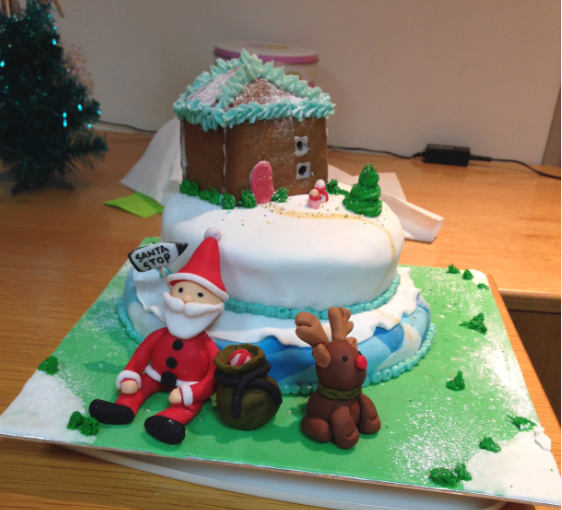 Second worst in the whole office but we managed to raise £40 for the British Lung Foundation! 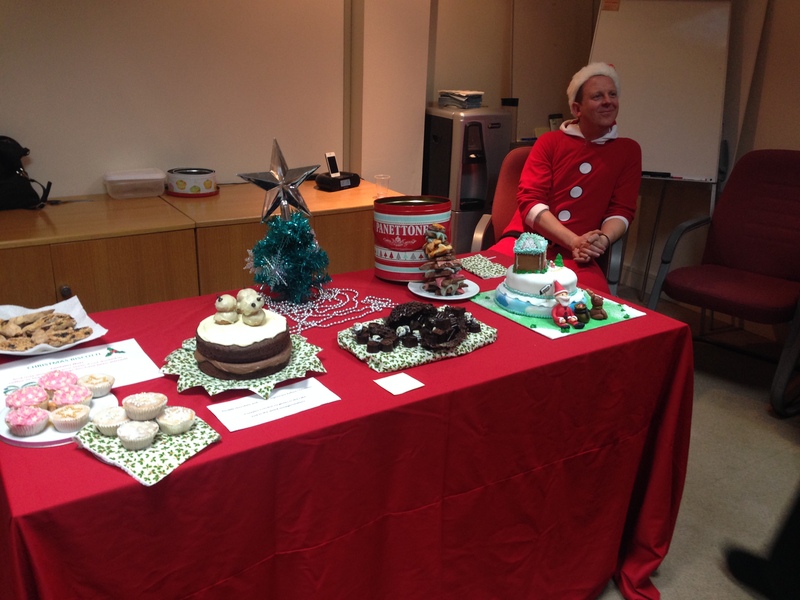 As part of the British Lung Foundation’s (BLF) Christmas celebrations we organised the first ever Great BLF Bake Off. 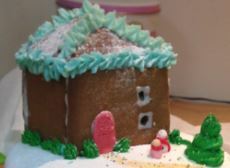 There were some fantastic submissions so I thought it would be nice to share some of the recipes. 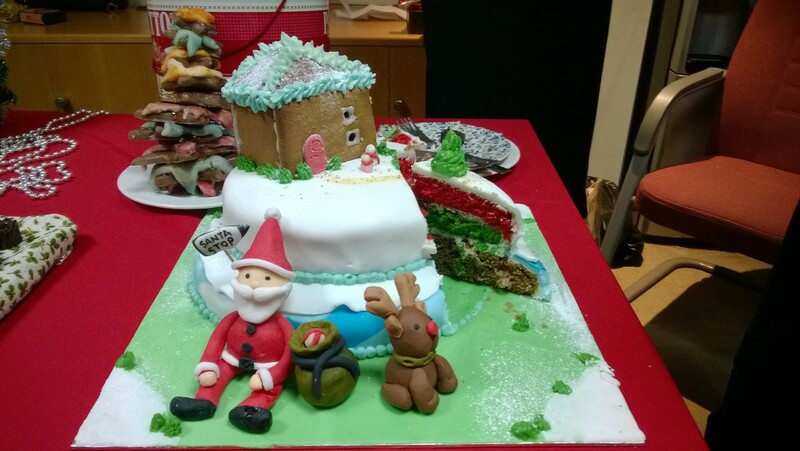 It a great way to get into the Christmas spirit and can also be a festive fundraising event. 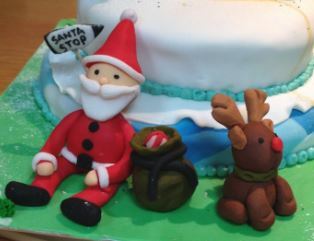 The overall winner of the Bake Off was the fantastic cake ‘Santa’s Coming to Town’ by lovely and talented, Cat Holland. For a full recipe please click here. My Homemade Chocolates won Dr Penny Woods’ special prize of most impactful and outreaching. Click here for the full recipe. 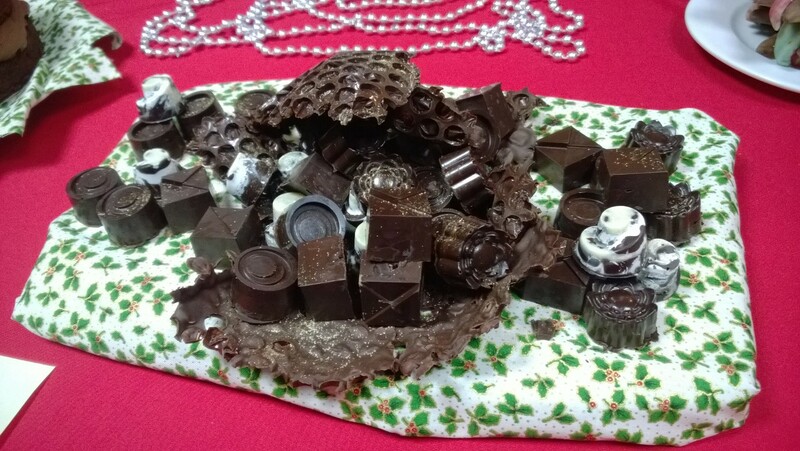 Every Christmas I like to try and make something different for presents, last year it was chutney and jam, this year I thought I’d try making chocolates. They are fun and not too hard to make, though a little fiddly but are incredibly luxurious tasting presents. I’ve been testing them on my colleagues at the British Lung Foundation (BLF) so I can make the perfect ones for Christmas. 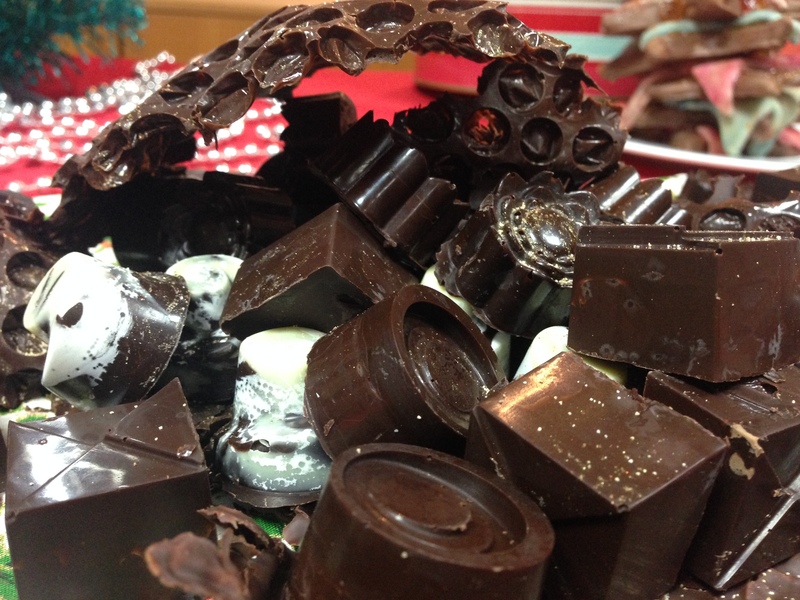 We had the first ever Great BLF Bake Off, the ideal opportunity to try and make some impressive chocolates. 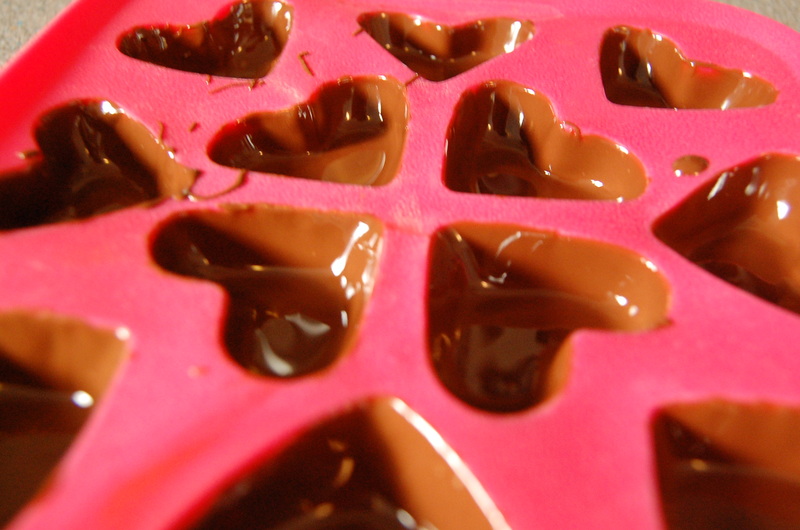 There are two parts to making chocolates, you have the ganache and the melted chocolate. Ganache is a fantastic way to get different flavours into your chocolates – this is when you can let yourself be as creative as you want. I have made a few different flavours so far which include vanilla, rum, chilli, walnut and peanut butter. Break up your chocolate in a bowl. Add your double cream to the saucepan and heat the cream – but you don’t want it to boil. Just before the cream comes to a boil add about half of it to the chocolate and stir – the cream’s role is to melt the chocolate. If the rest of your cream has cooled down reheat it and slowly add to the chocolate and continuously stir it to make sure it all melts. If you want different flavours for your fillings separate the ganache into separate bowls and then add the different flavours. Add as little or as much as you like of each (though if you are adding a liquid be careful not to put too much or it will be too liquidy). When you have added your flavours cover each bowl with cling film and put in the fridge – this will help it harden. Your ganache will last for about 2 weeks in the fridge. 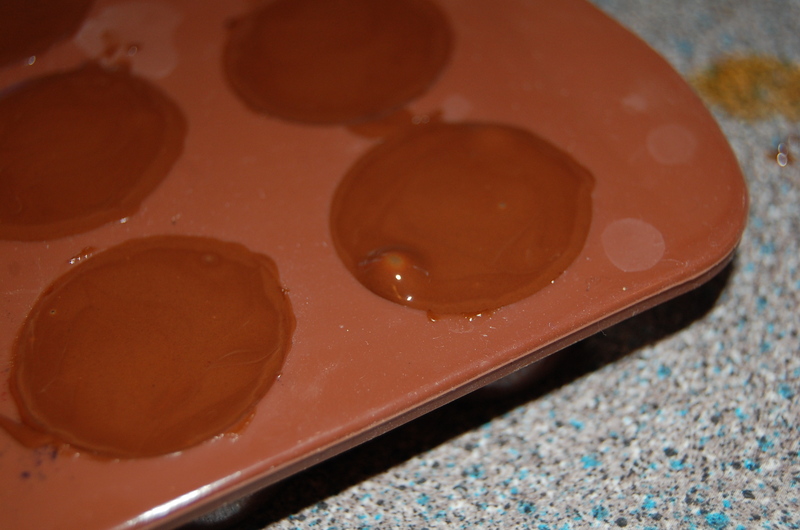 The most important thing when making chocolates is tempering (melting) your chocolate properly. If the chocolate over-heats your chocolates won’t have a glistening colour and snappy texture, and with gradually develop a white film over them – which is very disappointing after all the effort that goes into making chocolates. I’ve never been very good at tempering chocolate and think it is a little down to my lack of patience but after a disappointing batch of chocolates I am prepared to wait as long as I need to ensure my chocolates shine! 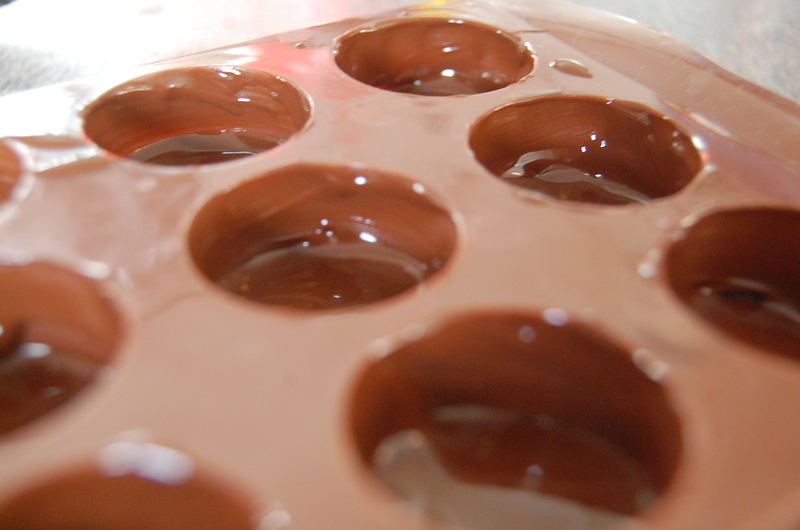 Melt your chocolate in a bain-marie (water bath), a technique used to slowly melt the chocolate at a low temperature. 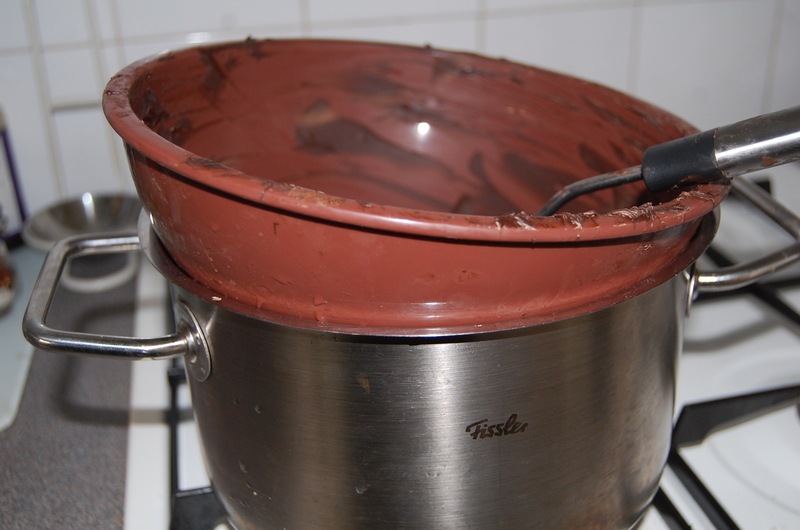 In the past my bowl has touched the boiling water but I have found it’s better to have your bowl sitting in the pan and not touching the water, so that only the steam is heating the bowl and chocolate. Some people use thermometers to ensure their chocolate doesn’t go past a certain temperature but my little trick is to boil water in a kettle add it to the saucepan and add my bowl of chocolate and not turn on the heat. I leave the chocolate to slowly melt and stir. Once the water temperature stops melting the chocolate, remove the bowl, turn on the heat and re-boil the water, then turn the heat off and put the bowl over the water again – continuously stir your chocolate with a spatula. 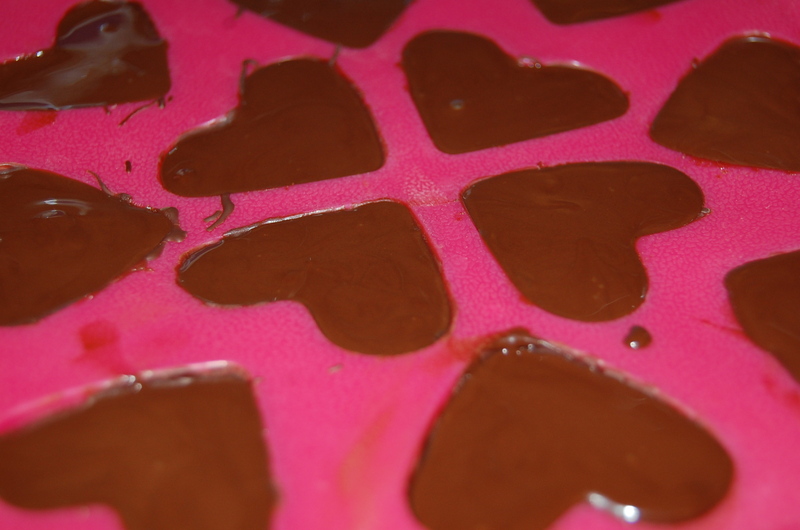 The chocolate should be smooth and silky and not gluppy or lumby. 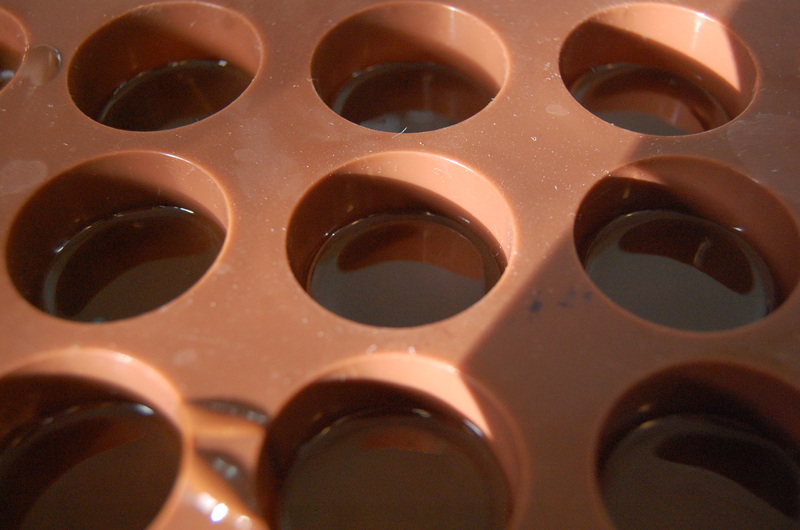 Now that your chocolate is melted you want to fill the bottom and sides of your moulds – the shell of the chocolates. I use a small spoon for the bottom of the moulds and then a tooth pick or wooden skewer for the sides – dipping it in the chocolate and then covering the sides. You don’t need the chocolate to be too thick. 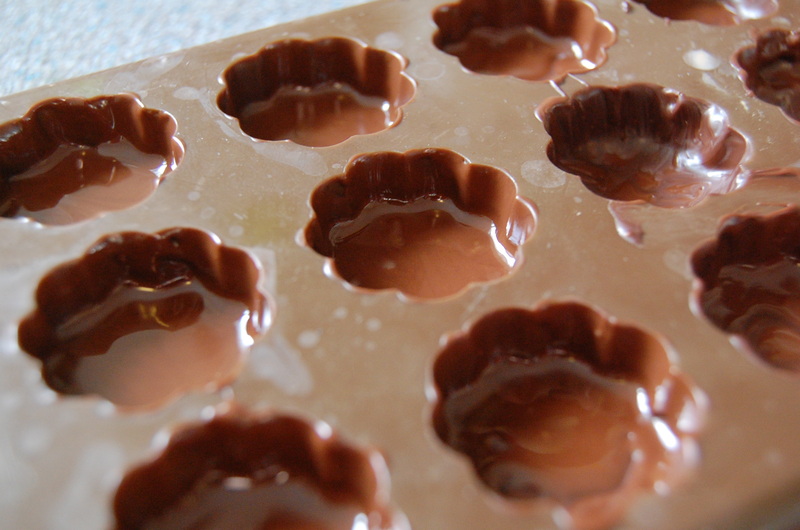 As you fill the bottom of your moulds, gently hit them on your kitchen surface. This will remove any trapped air in the chocolate. Leave your moulds at room temperature (my kitchen is usually the best and coolest room) to cool. At no point do you want to put your chocolate in the fridge – this will make them whiten. Once your chocolate has set – this can take around 30minutes to an hour – you can add your ganache. Use a spoon or pipe (I use a small spoon) and fill them about 3/4 of the way. 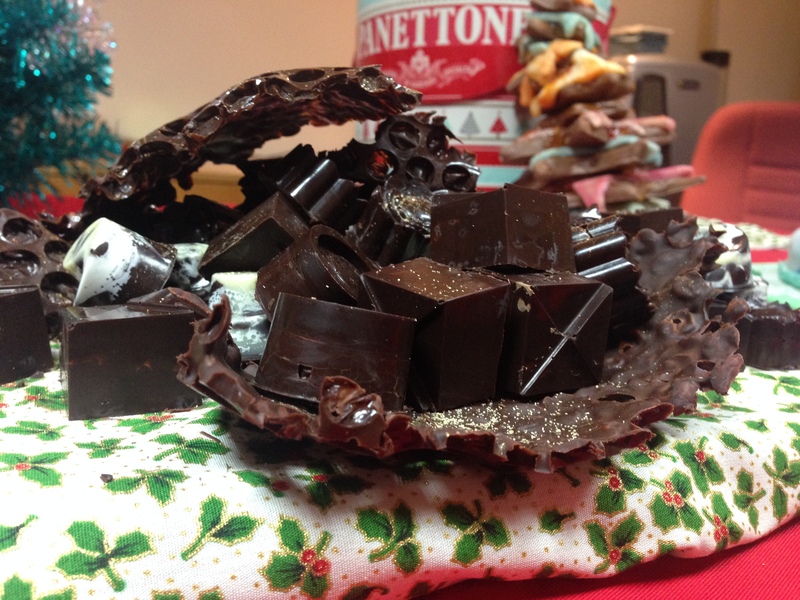 Re-melt your chocolate – this shouldn’t take long and a boiled kettle should be enough. Using a spoon or pipe fill your moulds and continually hit on your kitchen surface to remove trapped air. Once filled leave your filled moulds at room temperature to harden. They should easily pop out of the moulds when done. Cut a small square/ rectangle of cardboard, cover with some Christmassy material, I use cello tape on the bottom. Place chocolates on the cardboard. Cover with transparent plastic paper – using a little cello tape again at the bottom to hold. Then tie a pretty bow around it to give that finishing touch.